Place to know about all IT Systems, Computer hardware parts like monitor Technical Specifications guide and buying tips. Monitors are used as the output device in the computer system; it is also called the screen in general. Whatever may be the machine there must be a monitor to see its output which is required for monitoring purposes. 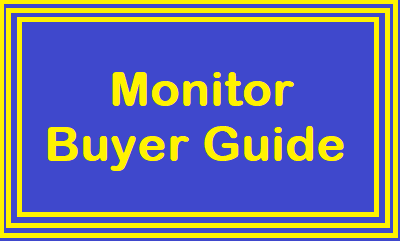 For servers, laptops, desktops, thin clients the monitor is required to see the output. Even the electronics devices, engineering equipments, medical equipment have the monitors as output device. So from this it is concluded that the monitor is the most important part of an electronic machine. From the past various monitors were invented time to time like CGA monitor, VGA monitor, LCD monitor, TFT monitor and the LED monitor which is currently used the most. These monitors mainly differ from their picture quality which is called the display resolution in the technical language. The CGA monitors were color graphics adapter with low resolution having two sub types of color and mono CGA monitors. The VGA monitors were Versatile Graphics Adapter which had more resolution as compared to the earlier one; these also have mono and color sub types. These both types of monitors were having the CRT (Cathode Ray Tube) which is also called the picture tube and is used to see the display picture. These VGA monitors remained in use for a longer period before the invention of the Liquid Crystal Display technology which is also called LCD where the CRT is replaced with this LCD. Going forward which the used of this LCD, a main drawback observed in LCD monitors that the picture was not visible clearly from the angles which was rectified with the invention of TFT monitors. After TFT, the LCD monitors came into pictures which are used these days also. 1. What are the need and the requirement – just observe the need, why should you require a monitor, how much time you will use it, according to that you can buy the monitor quality and the brand. 2. The size of the monitor – what is the size of the monitor you require, depending upon your work duration and eye vision, you should choose the size of the monitor like 15-inches screen, 18.5 inches or 20 inches and so on. 3. The most important is brand name – Always try to buy the latest technology like LED monitors these days, try to buy the latest one and of the good brand. Do not ever buy the local made monitors. After all quality also matters.